Coos Bay, Oregon’s largest bay is an anomaly that is dominated by saltwater. The bay receives comparatively little water from the rivers flowing into it. The Conde McCullough Bridge is the dividing line between West Coos Bay and East Coos Bay. The Conde McCullough Bridge was named in honor of the engineer who was a leading innovator in early bridge design of Oregon’s coastal list of bridges. The Estuary Reserve at South Slough in Coos Bay is an attraction that will provide visitors with insight to the functional values associated with estuaries. A large percentage of all marine species depend on the ecological productivity of estuaries for their survival. Information compiled from scientific studies at the South Slough Estuary Reserve should be used to restore the functional values to Oregon’s other bays and estuaries. To view the Oregon State Marine Board website on boating hazards when crossing the bar at Coos Bay. The website describes the dangerous tidal conditions affecting safe boating when entering or departing Coos Bay as listed on the Web Page for the Oregon State Marine Board; then click on the tab, "water levels/navigation charts" listed under the column, "safety & Education" to view the navigational advisories of interest for boaters and Coos Bay. The bar at the entrance to Coos Bay is usually safe to cross but the boater should be prepared to deal with fog and the waves generated by the prevailing afternoon winds. The last 300 yards of the north jetty is submerged as is the last 100 yards of the south jetty. The submerged jetties are subject to breakers most of the time. A submerged jetty extends 500 yards off the east shore of West Coos Bay 0.8 of a mile NE of Coos Head. The jetty extends in a SW direction from the east shore at a location from just above Fossil Point towards Coos Head. A light with a seasonal fog signal marks the north jetty. A lighted whistle buoy is 1.8 miles WNW of the entrance. The following underlined areas describe some of the dangerous tidal conditions affecting safe boating when entering or departing Coos Bay. Click on Coos Bay to view the Oregon State Marine Board website The website describes the dangerous tidal conditions affecting safe boating when entering or departing Coos Bay. Sand spit, South Slough. As you leave the Charleston Boat Basin, the South Slough sand spit is on your left. It extends north, parallel to the channel from South Slough buoy #4, approximately 450 yards toward South Slough light #2. Presently, nun buoy #2T marks the north end of the sand spit. Do not cross this area. Submerged jetty. When you proceed out from the Charleston Boat Basin in the South Slough channel, and are directly between South Slough light #4 and can buoy #5, directly ahead will be South Slough light #1, marking the end of the submerged jetty. This jetty is visible only at low water. When departing the Charleston Boat Basin, stay to the left of light #1 at all times. Sand spit, north beach. This area is dangerous because of shoal waters and submerged jetties. Occasionally on a strong ebb there will be breakers in this area. Avoid this area because of the possibility of going aground or striking submerged jetties and pilings. Note, too, that inbound and outbound tugs with tows, freighters, and so forth, pass close aboard this area and cannot stop for obstructions in the channel—including small vessels. South jetty, Guano Rock area. This is a very dangerous area because of shoals that extend out from the south jetty to the entrance channel. Breakers are frequently experienced from Guano Rock lighted whistle buoy #4 extending out to just past the end of the south jetty. Exercise care in this area at all times, especially on ebb tides. North jetty, submerged. The north jetty extends approximately 200 yards to the west. The outward end of the jetty is submerged from the visible end of the jetty out toward buoy #3. Never cross this area. There are breakers in this area most of the time. When departing the bar northbound, be sure to pass buoy #3 before turning to the north. Area north of buoy #5. This area can be very dangerous when there are any large swells on the bar or during ebb tide. Freak breakers are common in this area. Many boats do transit this area on occasion, but it is strongly recommended that you never cross here. Rough Bar Advisory Sign is positioned eight feet above the water on jetty just north of the Charleston Boat Basin. This is a two-part sign, facing toward the Charleston Boat Basin and toward South Slough light #2. The Charleston Coast Guard station records weather and bar conditions; you may obtain this information by phoning (541) 888-102 or (541) 888-3267 before boating in Coos Bay. Good fishing for salmon extends over a wide area outside of Coos Bay and the area with the hot bite varies throughout the season as the salmon migrate offshore. Fishing for rockfish is excellent from Baltimore Rock to Gregory Point southward through the rocky structure associated with Sunset Bay and from Rocky Point to Simpson Reef. Fishing is excellent for Rockfish and Chinook salmon along Whiskey Run Reef located southwest of Cape Arago. Feeder salmon enter lower Coos Bay during the summer usually in July feeding from Charleston to Fossil Point north to Jordan Cove. Chinook salmon: Good fishing for salmon extends over a wide area outside of Coos Bay and the area with the hot bite varies throughout the season as the salmon migrate offshore. Fishing for rockfish is excellent from Baltimore Rock to Gregory Point southward through the rocky structure associated with Sunset Bay and from Rocky Point to Simpson Reef. Fishing is excellent for Rockfish and Chinook salmon along Whiskey Run Reef located southwest of Cape Arago. Feeder salmon enter lower Coos Bay during the summer usually in July feeding from Charleston to Fossil Point north to Jordan Cove. Large numbers of Chinook Salmon begin returning to Coos Bay during the last half of August before peaking in September and running into October before declining in November. The most productive fishing occurs early in the run by trolling a plug cut herring with the incoming tide from the jetty jaws to the Empire Boat ramp. Troll a plug cut herring, spinner or spinner bait combinations with the incoming tide through high slack tide in the deepwater channel from the Empire Boat ramp to the Conde McCullough Bridge. Back troll or back bounce with the outgoing tide mini mooching or trolling a plug cut herring, a bait wrapped Flatfish lure or a spinner bait combination seaward from the Empire Boat ramp or the Conde McCullough Bridge. The most productive fishing in east bay occurs in the Marshfield Channel trolling a plug cut herring, spinners, spinner bait combinations or bait wrapped Flatfish lures with the incoming or outgoing tide with from the mouth of Isthmus Slough upriver to the Chandler Bridge. Local fishermen concentrate fishing from the mouth of Catching Slough upriver to the Chandler Bridge. Fish the 4.8 mile tidal reach of the Coos River from the confluence of the Millicoma and the South Fork of the Coos Rivers to the Chandler Bridge trolling with the incoming tide through high slack tide or back trolling or back bouncing with the outgoing tide using a plug cut herring, bait wrapped Flatfish lures, spinners or spinner bait combinations. Drift with the tidal current back bouncing a walnut sized gob of salmon eggs and sand shrimp combination or drift with the tidal current using a free sliding bobber to fish a walnut sized gob of salmon eggs and sand shrimp suspended just off of the bottom. Anchor above the up current side of the deeper holes during the outgoing tide and fish on the bottom with bait wrapped Flatfish lures; bait sweetened Spin–N–Glos, wobblers or a walnut sized gob of salmon eggs and sand shrimp combination. Fish in the approximately 9.7 mile tidal reach of the Millicoma River to the community of Allegheny or the South Fork of the Coos River to the community of Dellwood. Drift with the tidal current using a bobber rig baited with sand shrimp and/or salmon eggs. Anchor up current from the deeper holes and fish on the bottom salmon eggs topped with sand shrimp, bait sweetened Spin–N–Glos or an assortment of wobblers. Troll with bait wrapped Flatfish lures, rainbow colored spinners or spinner bait combinations. Isthmus Slough Step Program at the Noble Creek Fish Hatchery for Fall run Chinook Salmon. ODFW sponsors a terminal fishery for fin clipped Fall returning Chinook salmon returning to Isthmus Slough. Each fall ODFW releases 650 thousand presmolt Chinook salmon into Isthmus Slough. The 3 - 5 year old Fall run Chinook salmon return each Fall to Isthmus Slough from the last week of August or the first week of September, peaking in September into October before declining in November. Coho salmon return in last week of August or early September peaking in late September info October before rapidly declining in November. A small number of Coho are taken nearly every month by anglers fishing for other species. Fish for feeder Coho salmon or migrating salmon by trolling plug cut herring, hoochies or streamer flies behind a wire spreader or diver in the upper half of the water column with the incoming tide from the jetty jaws to the Jordan Cove. Steelhead in the Coos/Millicoma, Coquille, and Tenmile Lakers Basins - ODFW is anticipating a slightly above average run of winter steelhead in the Coos, Coquille and Tenmile Lakes basins. The winter steelhead season in the Coos and Coquille basins typically begins around Thanksgiving, and in some years steelhead can be available into April. This year a few steelhead have already shown up in the Coos Basin in late October. The peak harvest occurs from late December to late February. Steelhead usually arrive a month later in Tenmile Creek, often not making the first appearance until late-December. These three basins are popular with winter steelhead anglers. Strong hatchery programs usually mean there are plenty of marked fish available for anglers to take home if they wish. In all three basins, only adipose fin-marked fish may be retained. In all three basins from Dec. 1, 2013 through April 30, 2014, steelhead anglers will be allowed to harvest 1 additional adipose fin-clipped steelhead for a total aggregate of 3 adult fish harvested daily. Unmarked steelhead are naturally produced, and must be released unharmed. Most of the rivers open to steelhead fishing in the Coos-Coquille-Tenmile basins are open through April 30. The hatchery programs in the Coos, Coquille and Tenmile use local stocks of fish for broodstock. Unmarked, wild steelhead are incorporated into the egg-take each year in an effort to keep the genetics, behavior and other characteristics of the hatchery stock as close as possible to those of the wild population. One possible benefit of using localized broodstock is a longer run, with fish returning from late November through spring. Hatchery steelhead for the Coquille River Basin are reared at Bandon Hatchery. There are no facilities in the Coos and Tenmile basins to rear winter steelhead to smolts. Subsequently, steelhead smolts for these two basins are reared at Cole Rivers Hatchery in the upper Rogue, and transported back for acclimation and release. ODFW is evaluating and adjusting acclimation and release sites in order to increase survival and contribution to sport fisheries by returning adult steelhead. Source ODFW. Check the ODFW fishing regulations for changes to the fishing current regulations. Novice anglers are encouraged to try drift-fishing roe and yarn or a corky on a leader about 20 to 24 inches under a three-way swivel. On the third eye of the swivel attach a short dropper (4-6 inches) of line, weighted to bounce slowly along the bottom. Adjust the amount of weight to allow the bait to drift at a natural rate, ticking the bottom periodically. Cast slightly upstream so that the bait is on the bottom by the time it is straight out from the angler. Bobber and jig combinations can also be a good method for the novice angler; if the bobber-to-bait length is adjusted accordingly it will keep the hook away from bottom snags. Long, straight runs with a uniform depth are good places to try this gear type. Sand shrimp are often added to the drift-fishing rig or on the jig to further tempt steelhead to bite. During steelhead season, don’t discount periods when the rivers are low and clear. By scaling-down your bait or lure size, and toning-down the colors, steelhead can be enticed to bite in clear water. For the bobber and jig anglers, a small black jig often works when a neon-colored or pink jig will spook fish. Flyfishing for steelhead is becoming more popular in the Coos, Coquille, and Tenmile basins. Drifting an egg fly pattern under a strike indicator is a very effective and simple technique to catch steelhead in the area rivers. Fly anglers can also catch steelhead by swinging flies through short to medium runs that have prime steelhead holding water. Another tip is to try fishing in the late afternoon/evening hours. Many steelhead anglers are out early in the morning and quit by mid-day. After the fish have had a chance to settle-down, and with most anglers off the river, you can have sections of river almost to yourself. Striped bass enter Coos Bay from the middle of March before spawning upriver in June. The larger mature striped bass enter the bay followed by schools of smaller striped bass feeding heavily on spawning herring. The larger striped bass move upriver to the tidal portion of the Millicoma River and the South Fork of the Coos River, but fishing is only allowed in the Coos River. The most productive fishing occurs in the Coos River drifting with the tidal current back bouncing a plug cut herring, strip bait cut from shad or by casting broken back rainbow colored Rapala type lures into schools of striped bass. After spawning in June the stripers move down river into the bay feeding heavily before returning to the ocean in the middle of September. The twilight of evening on a high incoming tide is the best time of day and tide to fish for striped bass in the estuaries. The best fishing in the bay occurs from late March to May and from late July to the middle of September. Fish for stripers as they migrate up into West Coos Bay from the South Slough up the bay into North Slough, Pony Slough and into the Haynes and Kentuck Inlets of East Coos Bay. Most anglers concentrate their efforts at the entrance to or in the shallow water of the Haynes and Kentuck Inlets of East Coos Bay and in Isthmus Slough as the stripers migrate up river to spawn. Black rockfish, blue rockfish and copper rockfish are year–round residents of the lower bay. Brown rockfish are occasionally caught in the jetty channel. The most productive fishing for black, blue and copper rockfish occurs after sunset in the jetty channel along the north and south jetties and in the small kelp beds along the shore at Coos Head during the incoming tide. Fish along the east shore from Barview to Sitka Dock and over the submerged jetty at Fossil Point and submerged portion of the North Jetty near Hungry Man Cove (near the east end of clam digging area 1). Bass are also caught among pier structure associated with the Ports of Charleston and Empire and at the base of the Southern Pacific Rail Road trestle located west of the Highway 101 bridge and along the riprap of the North Bend Airport. Ocean Perch: Striped seaperch, Pileperch, white seaperch, walleye surfperch, redtail surfperch and silver surfperch enter the bay in the spring during April with the greatest number occurring during the summer months of June and July. Schools of perch move onto the tidal flats feeding heavily on intertidal animals upstream from the entrance to the bay into the South Slough up through West Coos Bay and into East Coos Bay. The fishing ranges from fair to excellent through fall depending on the tides and the weather conditions. Striped seaperch are most commonly caught perch caught followed by pileperch, white seaperch, walleye surfperch, retail surfperch and silver surfperch. Coos Bay offers the most productive fishing for pileperch and white seaperch for any of Oregon’s bays. Fish along the channels that drain the tidal flats associated with South Slough, West Coos Bay up through the Jordan Cove and along the riprap associated the North Bend Airport. The area around Buoy 12 is a local perch hotspot. Fish among the structure associated with docks of the Port of Charleston, the Empire Boat Basin, North Bend and the Port of Coos Bay. Fishing can be excellent in the channel that drains the tidal flats of North Slough, Pony Point Slough. Fish around the railroad trestle at Pony Point and in the deepwater channel off Russell Point that drains the tidal flats associated with Haynes and Kentucky Inlets. Fish along the deepwater channel that drains the tidal flats of North Point and among the pilings under the docks associated with North Bend and Coos Bay. Kelp greenling, rock greenling and whitespotted greenling enter the bay with the tide throughout the year. The overall catch rate for greenling rates 3rd behind Yaquina and Tillamook Bays. The best fishing occurs in the lower bay from May through August along the submerged structure of the jetties, among the pier structure associated with the Port of Charleston and up the bay past Pigeon Point. The best fishing occurs on the eastside of west Coos Bay but declining numbers further up the bay to Menasha Dike (Transpacific Parkway). Lingcod fishing is the best from January through April with February and March being the most productive. Fishing during the spawning period is excellent along either ocean side or the bayside of the north or south jetties and inside the bay to the Charleston Bridge. Cabezon are found all year among the jetty rocks, especially the submerged jetty in addition to the sections of the north and south jetties. Cabezon move into shallow water during March to spawn. The spawning period is the best time to fish for cabezon. Fishing is slow the rest of the year. Pacific herring enter the bay to spawn in February, March and into April. Empire Public Fishing Pier is located in the community of Empire at the Empire boat ramp. Crabbing and fishing from the pier is fair at best on an incoming high tide. Coos Bay Jetties – The north jetty is accessible from the Trans Pacific Parkway via Horsfall Beach by 4–wheel drive vehicle. The south jetty is accessible from the Coos Head road. The fishing for bass, sea trout, cabezon, lingcod and salmon from both jetties is excellent. Fish for bass on an incoming tide from the south jetty after sunset, but be careful south jetty is subject to large breaking waves especially near Coos Head. As always the angler should avoid the jetties during periods of heavy swells, and should never venture onto the jetty alone. Bank fishing access in Coos Bay limited; however, fish for bass, sea trout, cabezon, lingcod and salmon from the south jetty at Coos Head or from the north jetty but one must be cautious because of the serious threat posed to one's safety by long ocean swells. Point Adams on the Charleston Spit offers the best fishing from shore in Coos Bay for all fish species. Fish for perch, sturgeon and striped bass for the end of the riprap seawall associated with the airport. Fish for perch and striped bass from the west side of the bridge on the Trans Pacific Parkway or from shore along the west shore of West Coos Bay or the west shore of the North Slough. Fish for sturgeon by parking on the turnouts along the Coos River Road paralleling the lower tidal reach of the Coos and Millicoma Rivers. Fish for sturgeon on the South Fork of the Coos River in the hole just upstream from the Myrtle Tree County Boat Launch or downstream off of Landrith Road. Coos Bay boat launches in West Coos Bay on the south shore are located at the Charleston Boat Basin in Charleston. The BLM operates a boat launch on the east shore of West Coos Bay that is accessed via the Trans Pacific Parkway but is closed at times because of sedimentation. The Empire crabbing dock and Boat Ramp a no use fee boat launch and is located in the community of Empire where the Cape Arago Hwy turns south to Barview and the community of Charleston. Launch at or the Port of Charleston, Empire Boat Launch or the BLM operated boat launch to access lower Coos Bay or the ocean. The East Coos Bay Boat Launches are located at the North shore boat launch Conde McCullough is located in the community of Glasgow via the North Bay Drive. The California Street Boat Launch is located in North Bend and the Eastside Boat Ramp is located across the Isthmus Slough from downtown Coos Bay via Hwy 101 exit Hwy 101 over the Chandler Bridge on Newport Ln, Hwy 241. to where it becomes 6th Avenue to D Street. Turn left onto D Street to the Eastside Boat Launch. The Eastside Boat Ramp is the boat ramp fishermen use to launch to fish the upper East Coos Bay for salmon. To access the primitive boat launch at Catching Slough turn right from 6th Avenue onto D Street, Hwy 241 the Coos River Hwy. Cross Catching Slough on the bridge crossing Catching Slough and immediately turn right from the Coos River Hwy onto Catching Slough Road and right again into the parking area for the Catching Slough Boat Ramp. Launch at Shinglehouse Slough Boat Ramp or the Green Acres Boat Ramp to fish the Chinook Salmon returning to Noble Creek fish hatchery. To access Isthmus Slough Launch at the Oregon Department of Transportation boat launch at Shinglehouse Slough in the community of Hayden on Isthmus Slough. Turn right into the driveway of the boat launch once you have crossed over the Hwy 101 Bridge over Shinglehouse Slough. Be sure to slow your vehicle down to make the turn into the driveway of the improved boat ramp. The Green Acres Boat ramp is a primitive boat ramp operated by ODFW. Call 800-720-6339 for additional information. To access exit Hwy 101 onto Hwy 42 to Coquille. Slow down to make the turn into the parking area for Green Acres. Use caution to observe the traffic exiting from Coquille on Hwy 42 onto Hwy 101 north. To access the upper tidal reach of the Coos River launch at Doris Place boat ramp located at milepost 7.2 on the Coos River Hwy. To access Millicoma River, launch at the Rooke Higgins County Park and Boat Launch located at milepost 10.0 on the Coos River Hwy. The Stonehouse Bridge Boat Launch is located 8.8 miles up the Coos River Hwy on the W. Fork Millicoma Rd from the Rooke Higgins Boat Launch. The Stonehouse Bridge Boat Launch a no use fee boat launch is operated by ODFW. For additional information call 800-720-6339. To access the Myrtle Tree County Boat Ramp located 8.2 miles from Hwy 101 on the South Coos River Ln. exit Hwy 101 onto Newport Ln. to the Coos River Hwy 241. Turn right onto the Coos River Hwy 241 to the turnoff from the Coos River Hwy to S. Coos River Ln. Turn left onto the S. Coos River Ln. Travel 4.7 miles to the Myrtle Tree County Boat Launch. The no use fee boat launch is operated by Coos County. For additional information call 541-396-3121. Coos Bay Crabbing: Oregon's largest bay is a salt water dominated bay that holds crabs longer than any other of Oregon's Bays......... 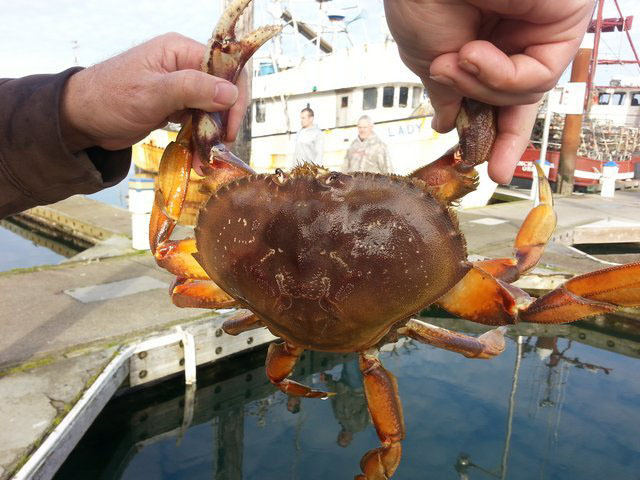 Recreational crabbing in the ocean now is open from December 1st of the current year thru October 15 of the following year. Recreational crabbing in the bays is open all year. Crabbing like all other salt water related activity in the bays is dependent on the tides. The most productive crabbing tides occur during the series of Neap tides followed by the minor tidal exchange of Spring tides. 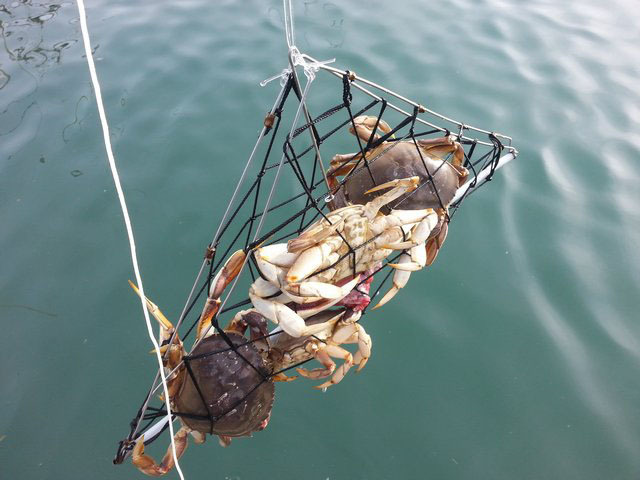 The most productive crabbing in Oregon’s bays occurs in the larger salt water dominated bays during the incoming tide, periods of slack tide and during periods between the low high tide and high low tide of the daily tidal cycle. 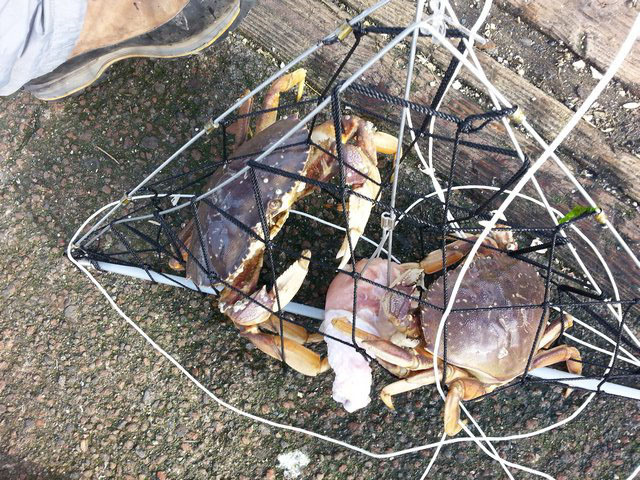 Crabbing productivity usually declines over a series of Spring tides. Crabbing is not as productive during the high velocity tidal current generated during the major tidal exchange of spring tides or during the outgoing tide. The crabs bury themselves in the sand to escape the increased current velocity of the outgoing tide. …… Remember crabbing in the bays is best during periods of neap tides. Warning this Spring the rough boating conditions have sunk 4 recreational boats. The weather has had a negative impact on the ability of crabbers to crab in the lower bay but. A word of caution while boating in the Coos Bay during the outgoing tide in combination with or without strong southerly winds associated weather fronts moving through the area: the resulting swells and wind chop can sink a boat in the blink of an eye. 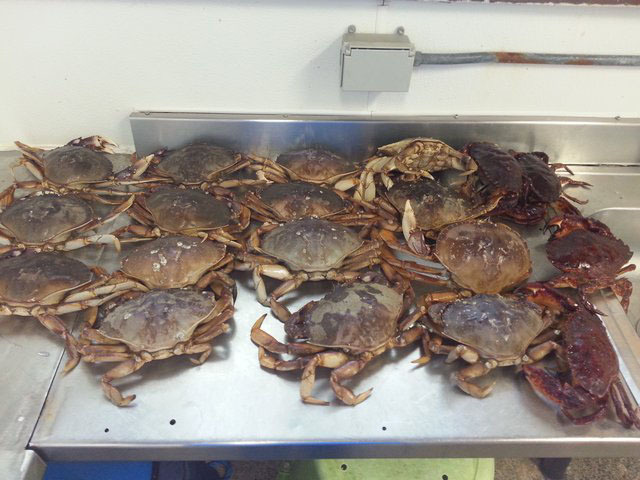 The Bites On is located at 750 Newmark Avenue Empire OR 97420 at 541-888-4015 the Bites On has the fishing, crabbing and clam digging in stock to satisfy your immediate needs; or you can rent crab rings and purchase rockfish carcass for 2.50 or mackerel at 4.99 a bag. When crabbing is productive crabbing with mackerel is worth the cost. Some salmon are being taken in the bay. Call the Bite's On for up to the minute information. Charleston is ground zero for launching your crabbing or clam digging adventures in Coos Bay. We suggest staying at the Charleston R/v Park or at one of the many motels in the area. Park host Susan Smith will do everything possible to make you stay in the area a pleasant one. The best crabbing docks have been the B/C and D/E docks in Charleston. The best baits for crabbing are fish, chicken or turkey legs. The best time to crab in the bays is good during the incoming tide but best at slacks tide and during periods of neap tides with minimal movement of water between the high low tide and low high tide. Crabbers Mike and Elli from New Jersey score crabbing at Winchester and Coos Bay. Mike contacted me earlier inquiring where he could purchase several Crab Max crab traps. His next email described his success crabbing at Winchester and Coos bay. That's great!, I responding. Did you crab from A Dock? How many crab were you and Ellie catch? By chance did you take any photos and if you did can you share them with us? 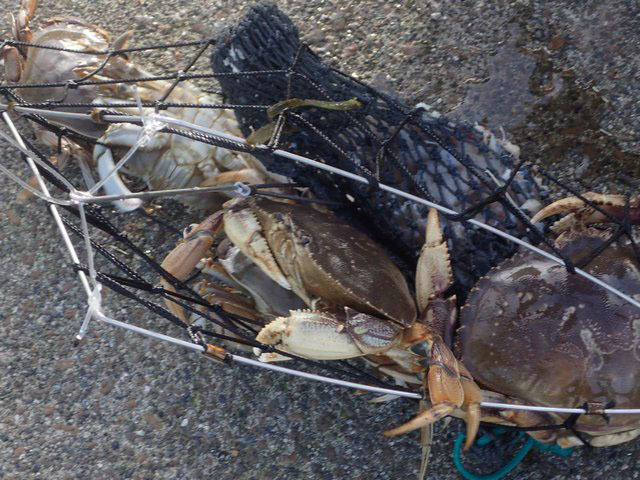 We love to see success; that is what crabbing is all about. Mike passed this on to me. We had a great time with the CrabMax. We bought two and also used two big collapsible box traps. We live in an RV so space is an issue. This is one of the reasons I like the crab max. We crabbed at the A dock in Winchester Bay and caught 10 keepers in two days. Just so you know, probably seven of them were in the crabmax not the pot. We went further down the coast to Charleston OR for a few days. We caught six the first day and 20 the next!!! 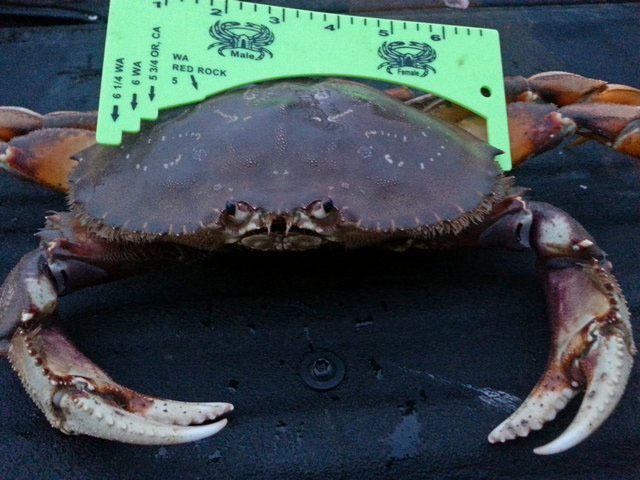 Again almost all were in the crabmax including one that was over 7 inches across. It did not matter what bait we used, chicken, fish or even "special sauced chicken". the crabmax out performed the other pots. And it was easier. So light and easy to haul up. When I pull a pot they are heavy and I feel like I am almost going to fall off the dock, but not with the crabmax. My only regret is that we did not get two more. But we will! Dgging Clams in Coos Bay is based on ODFW Seacor studies. "Geoduck clams actually exist in Coos Bay. ", exclaimed clam digger John. We thank clam digger John for sharing his Geoduck clam with us, however very few have ever been dug from Coos Bay. The`re are reports of a few Geoduck clams taken from Clam Island. I found one while filming the video clip for cockles in South Slough, but I was not prepared to dig it and I was never able to return to the spot with the proper equipment. I dig not want to fail in any attempt to dig the clam so I left it alone. Digging clams in Coos Bay produces all the clam species of interest to recreational clam diggers (razor clams, Geoduck clams, gaper clams, butter clams, Manila clams, softshell clams and cockles. Coos Bay offers the most productive clam digging found in any of Oregon’s bays. The gaper, cockle and butter clam beds extend from the South Slough to the Airport. Littleneck clams are found in association with butter clams in South Slough, Bar View, Pigeon Point and Strawberry Island. Softshell clams are found in Pony Slough, North Slough, and Haynes Inlet and along the east shore of East Coos Bay. Piddocks clams are found at Pigeon Point. Razor clams are dug from the sandy beach at Bastendorff Beach, the North Spit and inside the North Spit at the Training Jetty. At times a limited number of razor clams are dug from the sandy beach from the Charleston Sand Spit that separates the Charleston Boat Basin from the jetty channel. Clam digging access points along the east shore of west Coos Bay are: at the parking area at the Empire Boat Launch, the Fulton St. sewage plant plus several public easements along the Cape Arago Hwy. Charleston clam digging access points: Turn onto Boat Basin Road then right onto Kingfisher Rd. and park next to the bay. Turn left onto Roosevelt and park at the end of the street. Dig for Empire and butter clams on Clam Island. All species of bay clams are dug on the North Spit accessible by 4x4’s via the Trans Pacific Pkwy. Access beyond the end of the paved road is by 4x4 vehicles equipped to deal with deep sand. North Spit Area Clam Digging: Access to the North Spit is by boat or via the Trans Pacific Parkway. Razor clams are located on the Oceanside near the tip of the North Spit and in the sandy substrate of the tidal flat at the Training Jetty just inside the North Spit. All species of “Bay Clams” are accessible from shore of the North Spit associated with Clam Island and Strawberry Island. Butter and Gaper clams dominate the tidal flats associated with Clam Island and Strawberry Island. Cockles and steamer clams (littleneck and Manila clams) are found in the tidal flats associated with Strawberry Island. The following video was sponsored by the World Newspaper of the CDAO initial clam clinics in Coos Bay for gaper clams on the North Spit. Coos Bay clam digging: offers the most productive clam digging found in any of Oregon’s bays. The average size of the gaper clams located in the Charleston Triangle and in the tidal flat located between the Cape Arago HWY and Randolph St. range from mostly small to medium but the clams are plentiful as are cockles and butter clams. Bill demonstrates raking cockles in South Slough at Crown Point across the channel from Kelly's Point. The harvest of empire/gaper clams has been good at the North Spit and Clam Island. The best harvest areas for the average clam digger without 4 wheel drive trucks are from the Empire/Charleston tidal flats along Cape Arago Highway, and within Charleston, north and south of the Charleston Bridge. Butter, gaper, and cockle clams are abundant in these areas as listed on the SEACOR maps below. Click on the image of the map of the crabbing and clam digging areas at the bottom of the page to enlarge it. If the image is still too small use the zoom feature on your browser to enlarge the image of the map. 1. Training Jetty sandy tidal flat contains large gaper clams and razor clams. The larger gaper clams found in sandy areas of the tidal flats are located at depths up to 39 inches. Gaper clams at this depth in sand substrate are too deep to be dug successfully with a shovel. Use the digging methods described in this book to successfully dig gaper clams from these depths. Razor clams are common to the area. Boat access to the Training Jetty is at entrance to Hungryman’s Cove. 2. Clam Island emerges at a +2.0 or lower tide and is only accessible by boat. Hungryman’s Cove is a small channel that separates the shoreline of the North Spit with the island. It features the highest densities of gaper and butter clams in Coos Bay. Cockles and some native littleneck clams are also found. Shoreline flats boast excellent gaper and butter clamming. 3. Strawberry Island tidal flats are located just north of Clam Island. Gaper and butter clams dominate the area followed by cockles and steamer clams. Clam Digging from the tidal flats associated witht the Caper Arago Highway is excellent for all species of Bay Clams. 4. Airport: digging for gapers and cockles is productive west of the runway. Boat access only. 5. Empire: the tide flats adjoining Empire are good for gaper and butter clamming. Parking and access is at a city parking area opposite of Fulton Ave .Sediments are soft and easy to dig in, however holes dug for gapers may cave in easily, choose good low tides. 6. Pigeon point: this expansive clam bed is productive and easily accessed. A good clamming area for butter, gaper and Piddocks clams. Access to the tidal flats is adjacent to the county easement area opposite of Grinnel road. 7. Fossil point area has good beds of large butter and gaper clams, however digging can be a little more difficult as the substrates include shell, and cobble. Access to the tidal flats is from the parking area at Beacon lane. 8. Barview: butter clams are the dominate clam species dug followed by gaper, cockles and steamer clams. 9. Point Adams large cockles can be raked along the sandy beach. Gapers occasionally recruit to the beach southwest of the point. Access is at the end of Boat Basin road. 10. Charleston Triangle Gapers and butters are abundant. Easily accessed from parking areas South of docks. 11. Charleston Flat Gapers and butters can be dug throughout the areas South of the South Slough bridge. Cockles can be raked toward the South end of this area. Access is at the Charleston visitor center, or turn south from the Arago Hwy onto Roosevelt and park at the end of the street. The parking area is the access point to the gaper, butter, cockle and steamer clams located on the large tidal flat just south of the Charleston Flat. 12. Indian Point: boat access only for cockle, gaper and butter clams. 13. Valino Island: boat access only for cockle, gaper and butter clams. 14. Ocean Beach razor clams at the North Spit and Bastendorff Beach. 15. Upper Coos Bay or East Bay (not shown) are the tidal areas up bay of the Railroad Bridge, North Slough and Haynes Slough are soft and muddy. Softshell clams can be found throughout, finding firm walking substrate is challenging. Areas around transpacific highway and North slough are occasionally used but the tidal flats are extremely muddy. Oregon's bar closure website. Check the NOAA Bar Observations website for updated closures and restrictions. Check the NOAA Bar Observations website for updated closures and restrictions for local bar observations of Oregon’s Bays. Click on the Marine Forecast from Florence to Cape Blanco to view the marine forecast featuring Small Craft Warning. Click the following link to view the Marine Forecast for the NWS Medford Zone: Coastal waters from Cape Blanco OR to Pt. St. George CA out 10 nm (PZZ356). The following NOAA link for detailed information for the Oregon Coast is a great source for planning your razor clam digging adventures. Click on the following link to see a detailed hourly forecast for weather and surf conditions on the southern Oregon Coast. LONG OCEAN SWELLS: Click on to view the Oregon Surf Report. Use the Stonewall Bank buoy or the St Georges buoy in place or the Port Orford buoy to view the height of the long ocean swells in Southern Oregon Beaches. Use the Port Orford buoy station 46015. to view the height of the long ocean swells. National Buoy Data Center observation reports for buoys off the Oregon Coast. Click on National Buoy Data Center to view the observations from buoys off the Oregon Coast. Recommended website: Click on the following link to see a detailed hourly forecast for weather and surf conditions on the southern Oregon Coast. Then click your coastal zone of interest to view the detail information compiled on the Marine Digital Point Forecast Matrix Interface. The local weather forecast for the greater Coos Bay area changes hourly. Waterfowl hunting in Coos Bay is allowed except in the following areas. That part of Coos Bay described as follows is closed to waterfowl hunting: Beginning on Russell Point at the north end of Hwy 101 Bridge across Coos Bay in Coos Co; west approximately 3/4 of a mi on Parallel 43°26´ to the Southern Pacific Railway to a point due north of the northeast point of the North Bend airport; south to the northeast point of the North Bend airport; southerly on the west bank of Pony Slough to the Charleston-North Bend Hwy; east on the Charleston-North Bend Hwy to the east bank of Pony Slough; northerly on the east bank of Pony Slough and Coos Bay to the south end of the Hwy 101 Bridge; northerly on the Hwy 101 Bridge to the point of beginning. The Cape Arago Highway OR 540 begins at the intersection of Sheridan Ave a divided road and Virginia Ave in North Bend where Sheridan Ave carries the northbound traffic of US 101. The Cape Arago Highway travels west along Virginia Ave, turning south onto Broadway St, then west again on Newmark Ave where it enters the city of Coos Bay and the community of Empire. At the western edge of the community of Empire Newmark Ave becomes Empire Blvd and turns southwest where Empire Blvd becomes the Cape Arago Highway. Cape Arago Highway passes through the towns of Barview, Oregon and Charleston. For its remaining length, the highway skirts the coastline to Cape Arago State Park, where it ends, becoming Cape Arago Road. 235.4 North Bend junction of Highway101 and the coast route OR 540 to Charleston and the ocean beaches associated with the Cape Arago Highway and the Seven Devils Road. Highway 101 continues south from North Bend paralleling the west shore of East Coos Bay through the City of Coos Bay rejoining the coast route at the junction of the Seven Devils Road north of Bandon. Mingus Pond a small pond located in Mingus County Park at N 10th St. and Cedar Ave downtown Coos Bay. Mingus Pond is stocked with catchable rainbow trout and contains largemouth bass. Coos Bay Boardwalk A unique opportunity to bank fish for chinook salmon in downtown Coos Bay. Students from Blossom Gulch Elementary School raise and release young chinook smolts into Blossom Gulch that flows under the streets of Coos Bay. Adult salmon returning to the Gulch congregate at the tide gate where the piped stream flows into the bay. Fall chinook salmon, late August through October. An occasional passing coho salmon, headed further up the bay. Use large bobbers with bait (salmon roe clusters and/or sand shrimp) or cast large spinners to catch these fish. You’ll need a large landing net to land them. Downtown restaurants, shops, motels and grocery stores are nearby. The Coos Bay Area Visitor’s Center is across the street from the Boardwalk, and has public restrooms. The Boardwalk is in downtown Coos Bay, at the foot of Anderson and Central Avenues, next to the northbound lane of Hwy 101. 1.0 Cape Arago Highway is the route to the crabbing and clam digging opportunities of West Coos Bay and ocean beaches continues along the east shore of West Coos Bay and through the communities of North Bend, Empire and Charleston to the junction of the Seven Devils Road. The Cape Arago Highway ends 14.0 miles at Cape Arago. The route along the ocean beach continues along the Seven Devils Road. The Empire Lakes (lower and middle lakes), within the city limits of Coos Bay, offer great fishing without even leaving town. An extensive forested trail system around and between the lakes will help you forget you’re in the middle of the city. Rainbow trout are stocked regularly from March to early June. Bluegill and yellow perch are also available. In the late springtime, small bluegill and yellow perch can keep young anglers busy. Try fishing a tiny crappie jig tipped with a piece of night crawler, under the smallest bobber you can find. Each lake has a boat ramp, but boating is restricted to small boats with electric motors or boats, kayaks, canoes and pontoon boats -- electric motors only. Boaters troll spinners or spoons, or fly cast to rising trout. 5.5 to 6.2 Cape Arago Highway is the location of access to the tidal flats associated with Coos Bay. Dig for clams in this section of the bay or pump for mud or sand shrimp. The lower bay offers excellent clam digging for gaper clams, cockles, butter clams and littleneck clams. Look for the large yellow beach access signs. Parking is extremely limited. The competition is keen for the few convenient parking places during clam tides. 6.7 Cape Arago Highway is another location for access to the tidal flats associated with Coos Bay. Dig for clams in this section of the bay or pump for mud or sand shrimp. 8.0 Port of Charleston is home to restaurants that serve excellent seafood. Dig for clams in this section of the bay or pump for mud or sand shrimp. Launch your boat and fish and crab in the bay or fish on the inshore reefs just outside the bar. The Oregon Shorebird Festival: One of the longest running bird festivals in Oregon is celebrated in late August or early September. The Coos Bay area offers some of the mostdynamic birding in the State. The festival is headquartered at the Oregon Institute of Marine Biology in the small fishing community of Charleston, OR. Charleston Marine Life Center at the Oregon institute of Marine Biology Located on the edge of the harbor in Charleston, OR, the Oregon Institute of Marine Biology’s Charleston Marine Life Center is an exciting place for discovery. Aquaria highlighting different coastal ecosystems, a tidepool touch tank, whale and sea lion skeletons, underwater video from deep reefs and undersea volcanoes, and a variety of specimens reveal the hidden and remarkable diversity of life off Oregon, from the coast to the deep sea. To access the Oregon Institute of Marine Biology in Charleston Turn north from Cape Arago Hwy onto Boat Basin Rd. The Oregon Marine Institute of Marine Biology is located .4 tenths of a mile on the west side of the street. Oregon Institute of Marine Biology: Five exhibit galleries focus on coastal ecosystems, deep-water habitats, fisheries, marine mammals, and ongoing marine research. From the CMLC’s windows, you can look out over the harbor as fishing boats unload their catch, and watch seals, sea lions and birds a few feet away. Find out about on-going marine biology research, check out a working ROV (Remotely Operated Vehicle), explore collections and zoom in with microscopes. 8.5 Seven Devils northern junction south is the access route to the beaches south of Cape Arago and to the South Slough Estuary Reserve at Coos Bay. The Seven Devils are named after seven hairpin turns that have been the cause of numerous automobile accidents. Travel on Seven Devils Road north of the Seven Devils Wayside is not recommended for RV’s and travel trailers because the road is narrow, windy and not paved. Visitors driving RV’s and pulling travel trailers should detour around the gravel road portion of Seven Devils Road via the West Beaver Hill Road to the East Humphrey Road and rejoining the Seven Devils Road to access Whiskey Run Beach, Merchants Beach, Sacchi Beach and Agate Beach. Public access to Sacchi Beach and Agate Beach is restricted by private property. 9.0 Coos Head is the location of the south jetty of Coos Bay. The south jetty at Coos Head can also be accessed through Bastendorff Beach. Fish for bass, sea trout, cabezon, lingcod and salmon from the south jetty at Coos Head. Be careful when fishing on the south jetty as the south jetty is subject to large breaking waves especially near Coos Head. The shore line of Coos Head managed by the BLM while the upland area of Coos Head is the property of the Confederated Tribes of Coos, Lower Umpqua, and Siuslaw Indians and is currently closed to access by nontribal peoples. 10.3 Bastendorff Beach is located just south of the entrance to Coos Bay and north of Yoakum Point. Access is gained via the Cape Arago Highway and is listed by ODFW as a location to dig for razor clams. It is also an excellent location to fish for redtail surfperch and striped bass. 10.7 Yoakum Point is located between Bastendorff Beach and Lighthouse Beach. Public access is limited by private property. Visitors have to park along the Cape Arago Highway and walk in. 11.2 Gregory Point is the location of the Cape Arago lighthouse and was the location of the Cape Arago lifesaving station. Three lighthouses have been built on Gregory Point. The first was built in 1866, the last in 1934. The lifesaving station was part of the tragic drama of cowardice and courage displayed at its worst and its best by the rescuers connected to the sinking of the steam driven ship Tacoma that ran aground off Umpqua Bay during a howling winter storm in January of 1883. Access to Gregory Point and to the lighthouse is restricted through the Coast Guard Station. Visitors have to park on Cape Arago Highway and walk in. Refer to the Oregon Sport Fishing Regulation restricting the taking of shellfish or marine invertebrates within the Gregory Point Subtidal Research Reserve. 11.2 Lighthouse Beach is located between Gregory Point and Yoakum Point. Public access is limited by private property. 11.7 Sunset Bay is located west of Coos Bay on the Cape Arago Highway. The fishing from the rocky shore is renowned for its excellence. There is good to excellent fishing for all shallow water rockfish species, sea trout, lingcod, cabezon, striped seaperch and pileperch including an occasionally white seaperch. Refer to the Oregon Sport Fishing Regulation restricting the taking of shellfish or marine invertebrates within the Cape Arago Intertidal Research Reserve. The best fishing is from the point on the north side of the bay. Kayakers honing their skills in the stormy surf at Sunset Bay. The point is accessible during an outgoing tide. Remember to keep an eye on the tide giving you plenty of time to leave the rocks before being trapped by the incoming tide. Use caution when fishing on the rocky shore at Sunset Bay or Cape Arago because the rocky shore is subject to the sudden onset of large breaking waves. The south shore of Sunset Bay isespecially dangerous. There is a small boat launch located at the far end of the parking lot that will accommodate small open boats. There are some anglers who fish in the ocean outside of Sunset Bay consistently, but do so only when the ocean is flat dead calm. The Sunset Bay State Park is a full service park with several volley ball courts and a golf course. The winter storms draw kayak enthusiast who practices their sport in the waves. 12.0 Cape Arago Highway is the location of the trailhead that leads to the rocky cove just south of Sunset Bay. There is excellent fishing for rockfish in the cove. 12.4 Shore Acres State Park is the former home of timber baron Louis Simpson who built two homes on the site. One of the homes burned and the other slid into the ocean leaving 7 acres of formal floral gardens. During the winter holidays the park is aglow with more than 200,000 lights to celebrate the season. The park offers winter visitors a surf and ocean spay show as storm driven waves smash into the shore in spectacular fashion. Shell Island offers a springtime visitor a view of the largest sea lion colony on the Oregon Coast. The sea lions arrive each spring to give birth to their pups. There is ample parking for all vehicles. The beach trail is located behind the garden. The fishing is good to excellent for the fish species common to the rocky shore: bass, perch, cabezon, sea trout and lingcod. 14.0 Cape Arago State Park consists of three coves located at the end of the Cape Arago Highway. There is ample parking for all vehicles. The trails to the rocky shore below the north cove, middle cove and south cove are located behind the parking area. The fishing is good to excellent for the fish species common to the rocky shore: bass, perch, cabezon, sea trout and lingcod. South cove is a sheltered cove located on the lee side of Cape Arago and offers boaters anchorage during the summer months. 238.1 Charleston junction to the ocean beaches on Highway 101 and Commercial Ave in the City of Coos Bay is the junction to Charleston and the ocean beaches associated with the Cape Arago Highway and the Seven Devils Road. 239.5 Coos River junction on Highway 101 in the City of Coos Bay is the junction to the Coos River, the South Fork of the Coos River and the Millicoma River and the community of Alleghany. 244.2 Junction of Hwy 101 and State Hwy 42 to Coquille and Powers. Power's Pond a 23.4 acre lake is located at the Powers County Park. The pond is stocked with catchable rainbow trout. The 1 acre Sru Lake and primitive campground is located 21 miles south of Powers. The area is home to, "Big Foot", sightings (Ha!). ODFW stocks the lake with rainbow trout. Hwy 101 continues south to Bandon. 257.4 Seven Devils southern junction west from Highway 101 is the access route to the beaches south of Cape Arago and to the South Slough Estuary Reserve at Coos Bay. The route south continues on Highway 101 to Bullards Beach and the coastal community of Bandon on Coquille Bay. Turn west from Highway 101 onto the Seven Devils Road and travel north to access Whiskey Run Beach, Merchants Beach, Sacchi Beach and Agate Beach and the South Slough Estuary Reserve at Coos Bay. The Seven Devils Road continues north and joins the Cape Arago Highway just west of the community of Charleston located on Coos Bay. The route along the east shore of West Coos Bay continues through the communities of Charleston and Empire to North Bend where it rejoins Highway 101. 3.9 Whiskey Run Beach off of Seven Devils Road allows beach access by motor vehicles and is listed by ODFW as a location to dig for razor clams and is an excellent location to fish for redtail surfperch and the occasional striped bass. As shown in the video clip Whiskey Run Beach is a great beach to beachcomb, Wind surf, fly kites or enjoy the beach with family and friends. 4.5 Merchants Beach is the location of the Seven Devils State Wayside and is an excellent beach to fish for redtail surfperch and the occasional striped bass. The Seven Devils State Wayside is a day use park with restrooms, picnic tables and ample parking for all vehicles. 5.0 Agate Beach is an excellent beach to fish for redtail surfperch and the occasional striped bass. Access to Sacchi Beach and Agate Beach from the Seven Devils Road is restricted by private property. Access to these beaches is by foot from the Seven Devils Wayside at Merchants Beach. 5.3 Sacchi Beach is an excellent beach to fish for redtail surfperch and the ocasional striped bass. perch and the occasional striped bass following the years when the striped bass spawn successfully in the Smith River. 8.0 South Slough Estuary Reserver The South Slough Estuary Reserve mission statement states, "To improve the understanding and stewardship of Pacific Northwest estuaries and coastal watersheds." This entry under development. Click HERE to return to Mile by Mile. Click HERE to return to the top of page.